Filters Plus’ range of coolant filters work to remove contaminants and maintain cooling system balance. This helps to keep hot-running engines cool and reduce downtime. It is estimated that around 50 percent of premature engine failure is due to improper cooling system maintenance techniques. Providing the correct water, antifreeze, filters and supplemental coolant additives is critical to coolant system life. 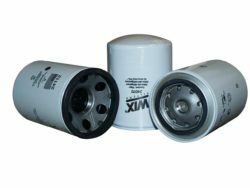 Filters Plus proudly supplies coolant filters and other filtration products from some of the world’s leading filtration specialists, including WIX, Donaldson, Mann & Hummel, Filtrec, Sakura, and Wesfil. These brands are renowned for producing some of the industry’s highest performing filters to meet your requirements. Our suppliers have applied years of research and development in filter media technology to create cleaner, high functioning coolant systems with improved heat dissipation and engine efficiency. Whether you’re working on-road or off, you can rest assured that a Filters Plus coolant filter will perform and protect the way a good filter should. Remove contaminants, maintain coolant chemical balance, and prevent engine downtime with the coolant filtration products at Filters Plus. Our trained staff will help you find the right filter for any commercial or industrial application.